For millennial travelers, luxury doesn’t always equate to cool. Five-star hotels with turndown service, Michelin-starred restaurants, and a staff where everyone knows your name isn’t necessarily what younger crowds are looking for. 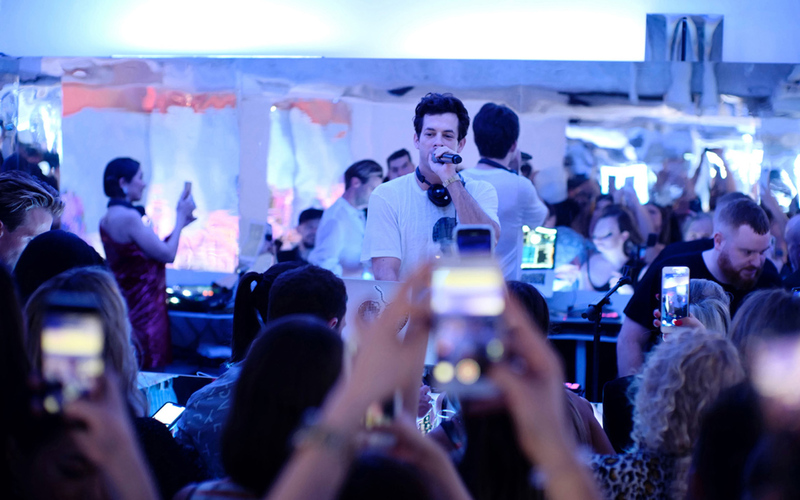 But while boutique hotels are popping up faster than Kylie Jenner can post to Instagram, one luxury hotel brand is luring in the youthful, influencer-inspired crowd with the thing they love the best: parties. 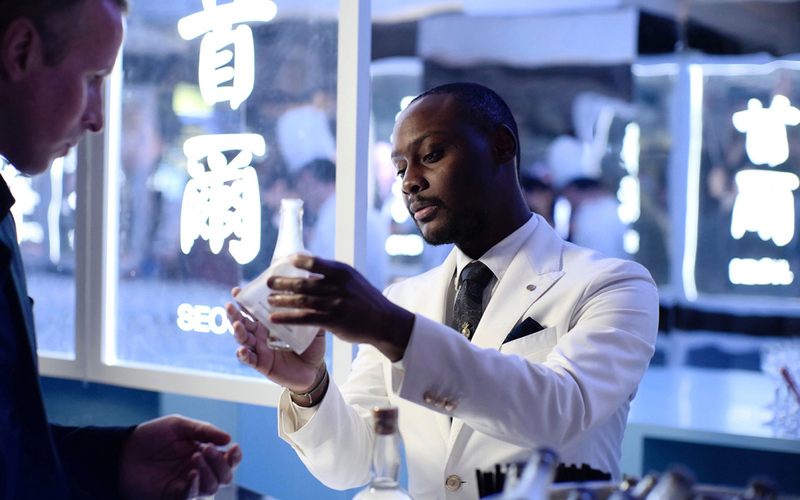 The is a “global series of immersive events” designed to highlight the very best of the luxury brand’s chefs, mixologists, and hospitality from Four Seasons properties around the world. 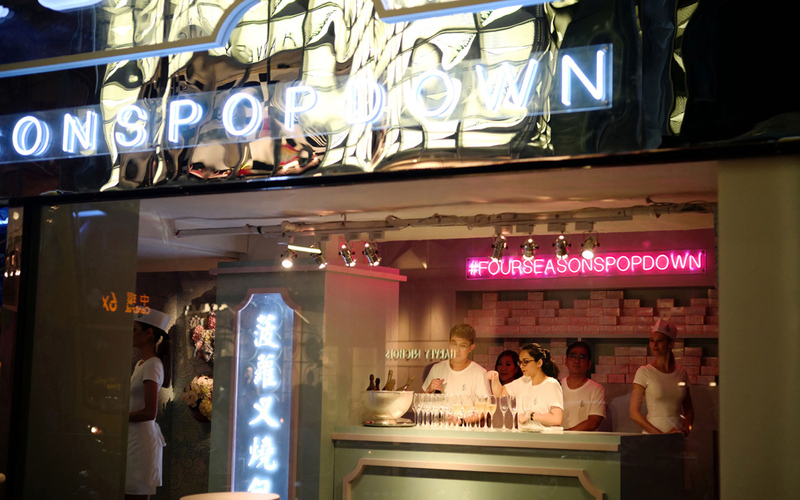 Designed to be bold and unexpected, the “Pop Down” — a clever play on the current trend of pop-up shops and restaurants — is actually more than a party: It’s an international event that’s taken over locations from to . The first event outside of North America, the Four Seasons Pop Down Hong Kong took the series to the next level. Set in a vacant retail space in Hong Kong’s Central district, surrounded by storefronts from the biggest names in fashion, this exclusive, invite-only event was never really what it seemed from the street. The front was, well, a front, and a seemingly hip bakery disguised the main attraction. Invited guests climbed through a retro refrigerator and into a culinary scene unlike any other during Hong Kong Art Week. Inside the blue- and purple-hued, mirror-lined event space, party goers were dressed to the nines while they snacked on international-inspired dishes and sipped on masterfully designed cocktails. — the culinary vision behind Lung King Heen and the first Chinese chef to ever be awarded three Michelin stars — served a baked fermented bean curd bun with chicken and pottage, while Chef Marshall Allen Roth of the Four Seasons Abu Dhabi at Al Maryah Island handed out twice baked potatoes with an entirely unexpected piece of — hold for dramatic effect — savory beef tenderloin hidden in the middle. The Pop Down highlights the best of the brand by turning the concept of a hotel on its head. First, that the event isn’t even at a Four Seasons property is proof that a hotel brand doesn’t just need its hotel to be relevant. Today’s modern, on and off of the property. They want cocktails in Hong Kong from a Mixologist from Seoul, like Keith Motsi’s Ribena-based concoction, before cracking open a giant golden chocolate walnut that looks like it popped out of Willy Wonka’s chocolate factory. Second, , and while events like this can easily feel reduced to a perfectly manicured and hyper-edited Instagram photo, nothing really felt forced. 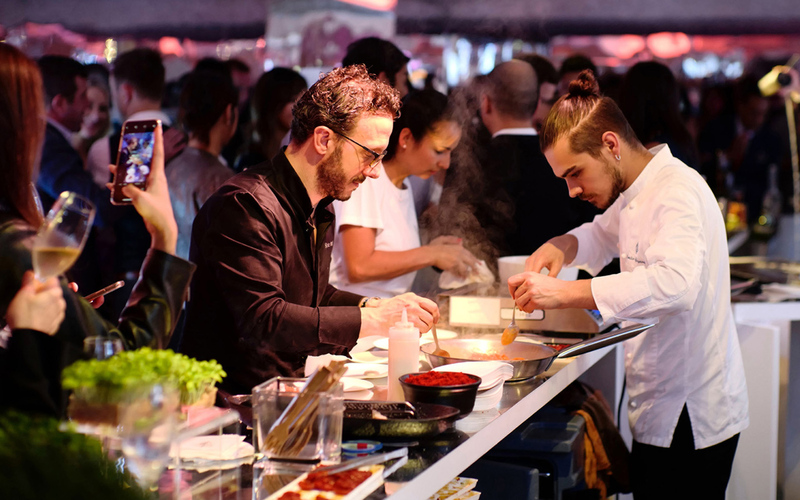 By bringing in artists, chefs, mixologists, and musicians from around the world and more or less just letting them do what they do best, it felt real. Toss in the fact that these people are on hand serving and interacting with guests — having actual conversations — and the experience feels even more intimate. What remains now is how Four Seasons — one of Travel + Leisure’s — can ride this wave while finding a way to be more inclusive. For the first time in the history of the event series, Four Seasons brought a taste of the evening to the masses by, in a reverse fake out, actually opening the bakery that hid the Pop Down to serve Chef Tak’s insanely delicious pineapple pork buns for free. Hopefully in the future, the Pop Downs will include even more opportunities for the general public to get involved and in on the action. Because exclusive is only cool until it isn’t — and if you want to bring a new generation of travelers on board, the number of followers they have shouldn’t matter. The next Pop Down location has yet to be announced, though the plan is for it to take place in Europe. But no matter where it happens, people should expect the same flair and finesse found in Toronto, Miami, Philadelphia and Hong Kong. Plus, lots and lots of food.